June 2002. Tom Taylor from Ruby Street sent in this class photograph. 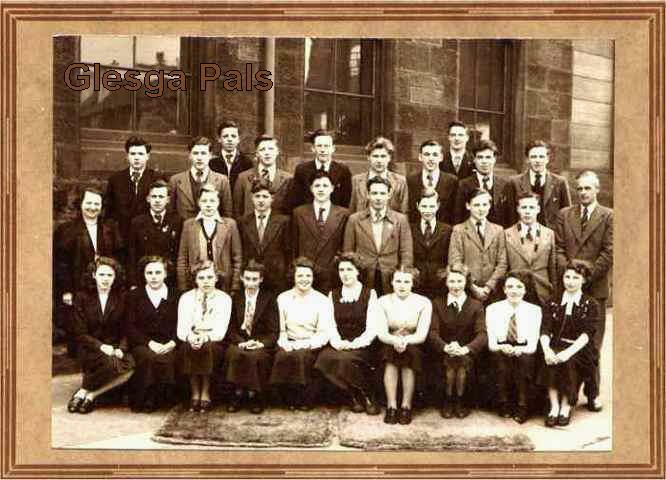 "......on your website I found my late husband's photo on the John Street Sec.school 1952 his name was Kenny Banner he is on the top row third from the left and it would be great to see his name there so I could give my 5 grandchildren a copy. He always talked with great affection of John Street school, my father in law and all his family came from Bridgeton, my husband never missed going to his Masonic hall there even although he had moved to Pollock. We have been in the USA since 1976. Thanks again , God Bless Josie /////////"
2nd. Row No.1 Miss Patterson French Specialist and Head of language Dept. 2nd. Row No.10 Mr. Gibson Head of Science Dept. Wonderful staff who brought me through my teenage "angst" and provided an example which has inspired me ever since.I am forever grateful to them and and to the working class folk of Bridgeton. They went before holding up a torch for me in the darkness. All the young lads in this school photograph were hoping to progress to some sort of career or at least an trade apprenticeship. The alternative to academic success was of course to be "called up" in each and every case for military service. At this time National Service was mandatory. This weighted heavily on many young men and distorted the lives of many.